A concept found all over Italy, a lido is a beach club that offers services including food and drinks, lounge chairs, umbrellas, changing stalls, bathrooms, showers, and sometimes even a swimming pool. Entrance is ‘al pagamento,’ and in the case of Capri, entrance (“ingresso”) and a sunbed (“lettino”) ranges from Eu 25 to 40 per person. All of the clubs have on site restaurants where you can dine. For the entire day of lounging and dining, you should plan on spending EU 70- EU 120 per person. In high season, reservations are required. Literally translating to “the song of the sea,” this lido has gorgeous views of Marina piccolo and the famous Fariglioni. It is a great choice for families, with an adult and a baby swimming pool. Services offered include private beach, two swimming pools, lounge chairs, private changing cabins, and a restaurant. More known for their restaurant, which is excellent, Da Gioia also has lounge chairs which can be rented for the day. The atmosphere is more casual than some of the other lido. Torre Saracena is more known for its restaurant, which is excellent, albeit expensive, and only open for lunch. One of the best meals on the island, a not to miss for real foodies. The atmosphere is casual, and there are a small number of lounge chairs that can be rented to soak up the sun. One may imagine that the first restaurant you see when exiting the aliscafo is to be avoided, but on the contrary. Esmeraldo has a killer kitchen, with a small beach club beside where you can rent lounge chairs. If you have some time to kill before catching your boat, grab a table and enjoy…the meal will not disappoint. Located next to the ticket booth in Marina Grande. 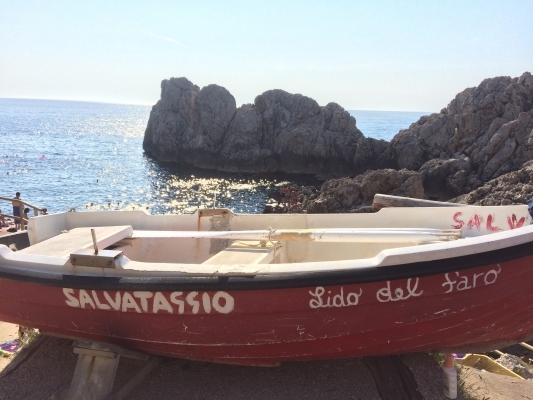 The only place on Capri where you’ll find white sand, Bagni di Tiberio is full of families and children. The lido can only be accessed by boat, they offer a shuttle from Marina Grande (there is a small counter adjacent to the ticket booth. The restaurant is very good, and well priced by Capri standards. One of the few beach clubs where you’ll find locals, Il Faro is located in Anacapri next to the lighthouse (from which it gets it’s name). They do not accept reservations, so go early to get a lounge chair (opens at 9am). The best place to watch the sunset, there are 2 bars above the lido where you can have an aperitivo and watch the sun dip into the horizon. The place to be seen, La Fontelina is a beach club near Punta Tragara and the famous Fariglioni. Super chic, you pay a premium to hang with the it crowd. In order to reserve loung chairs, you must reserve a table for lunch as well. They have a strict reservation policy, they require a credit card to hold your table and no shows will be charged.